Ya Jagoff!!! | This Week It's 2 "Prependicular" Peter Parkers! Home Parking Jagoffs This Week It’s 2 “Prependicular” Peter Parkers! We think we might have to change the name of this from, “Peter Parkers” to “Parkers That REALLY Don’t Give A @%$*!” Like, they don’t even care enough to TRY and do the right thing. Then the Jagoff-estrator gave us an idea. As you know, we would NEVER recommend that you deface/destroy another person’s property. That would make YOU a Jagoff! However, you can draw AROUND their property!!!! But hold on for that. Something else first! Thanks to a suggestion from loyal follower B. Kane, we have added a printable file of a sign you can use to call attention to people’s lack of parking efforts. 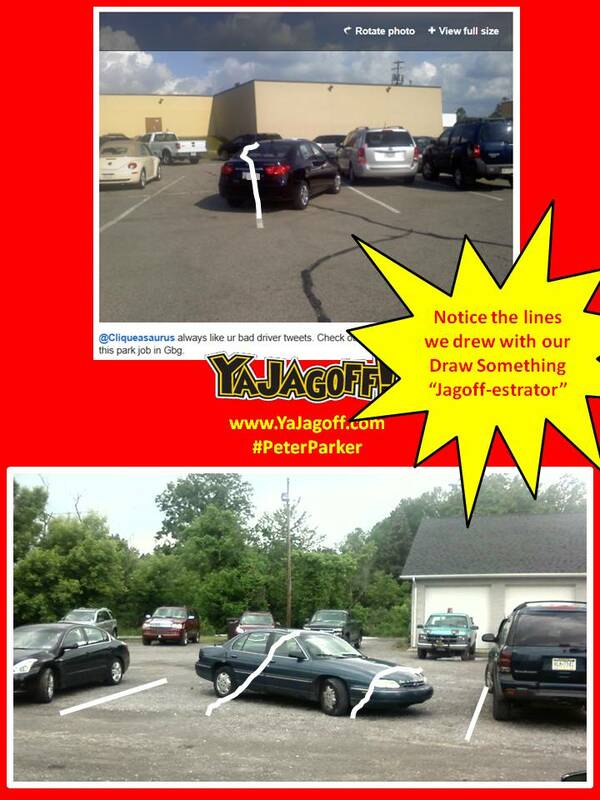 In Bob’s words regarding a non-Pittsburgh website that he found highglighting bad parking efforts, “You can even print out phony ”tickets” you can fill out and put under the windshield wiper of said parking jagoff. “Go HERE of you want the printable file. Both drivers (the black car from Greensburg and the blue care from Lawrence County) are former high school band members and they are used to marching around SPELLING things out along white lines so that people looking on from the stands are amazed and amused. As we see it, the guy in the black car is making an APOSTROPHE and, the guy in the gravel lot is coordinating the letter I or H or even a T. We can’t tell, cuz it’s like trying to figure out the difference between a 6 and a 9, it’s all a matter of your perspective. Maybe not! Hey Peter Parkers, when your GPS says, “You have arrived” it doesn’t mean “stop right now and put your car in park wherever you are at this very instant.” Learn how to park AND be considerate humans, Ya Jagoffs! Special thanks to faithful follower Mary Mac (Mary Mac’s Bakehouse) and @RayKuchinka of East Coast Turnaround for being Honorary Jagoff Catchers today Mary was actually late for a softball event because she took time to snap off a few pics! Now THAT’s dedication!!! Day 2 Of the Creta Farms Prize Pack Contest. 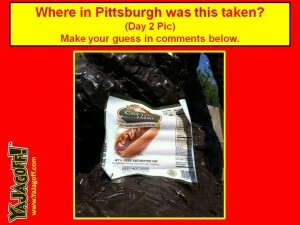 Click on the photo below, go to the COMMENTS and tell us where in Pittsburgh you think it was taken. Previous articleCall Before You Dig – OR RESURFACE!!! Next articleYes, The Red Light Means “STOP” …Just Not Right THERE! PRINTABLE TICKETS! Ha ha. Genius. I have a fear of Peter Parkers with guns though… ha ha. Love! Terrific post (as usual), and I can’t wait until I submit my first Peter Parker. Chalk loaded and ready to go. Can you add an “a” before parking? Hate to leave something with a typo. Damn!!! Sorry.. will fix and reload!!! too many late nights of writing!! THANKS!